Diagrammatic section at right shows the integrated high-performance design systems of the James Learning Center. 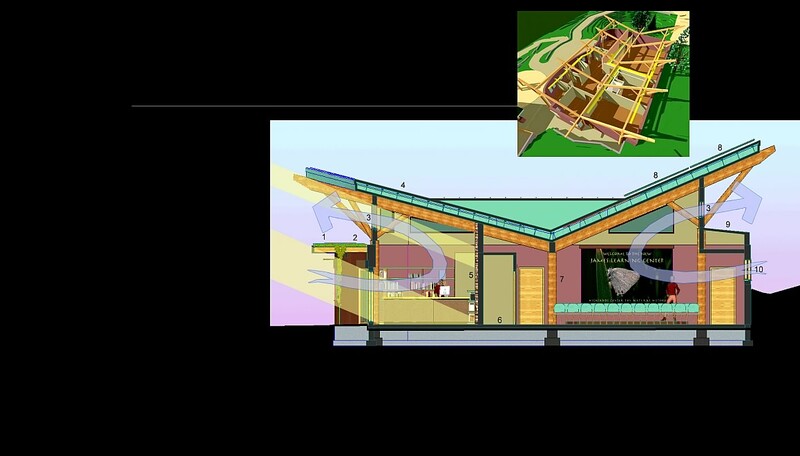 Operable clerestory windows north and south, sized for maximum solar gain and daylight contribution (with minimal heat loss), also serve to ventilate the building when needed. A south facing interior stone wall, built from rock harvested on site, stores solar heat during the cold winter months, warming the building and stabilizing indoor temperatures. Deciduous vines trained over the lower south-facing windows, allows sunlight into the building during the winter, while shading out solar gain during the summer. Reflective light shelves north and south help bounce additional daylight into the interior of the building.